is it possible to differentiate from which source midi input is coming? 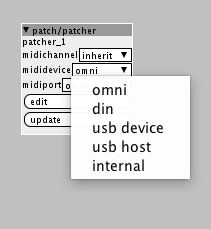 I control my patch with a midi controller which is connected to usb_host_port1 of the axoloti. to a sequencer which is connected to the axolotis din input. Is there a way to change the midi handler somehow? I did this already but how can I select the input from the different sources then? you can only do this on patch compilation, not while running, is that your question? or did you not get a midi selector at all on the subpatch? you have to open the subpatch and go to edit settings and check "has midi selector"